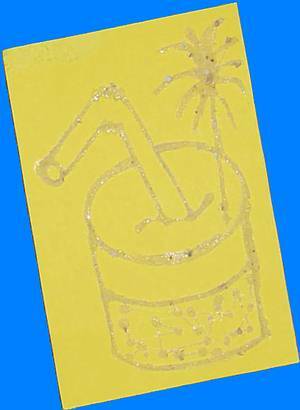 These sand cards make good table decorations and/or menus, or can be used as invitation cards, birthday cards etc. Thick paper or brightly coloured cardboard is cut to the desired size e.g. 11x15cm or 15x21cm. The motif is drawn on with pencil. Next, pritt stick is spread very thinly over the pencil markings. Fine sand (e.g. 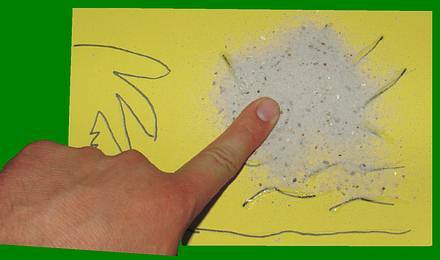 sand for a bird cage) is then sprinkled onto the pritt stick and pressed on gently using your fingers. Leave it all to dry and using a small paint brush remove and excess sand.